"John Coltrane - Ascension - 9 CD Box Set of Japanese OBI Mini Replica LP Titles"
JOHN COLTRANE - ASCENSION - Japanese OBI MINI REPLICA LP TITLES making a 9 CD Box Set- WHAT IS A JAPAN "MINI-LP-SLEEVE" CD? Have you ever lamented the loss of one of the 20th Century's great art forms, the 12" vinyl LP jacket? Then "mini-LP-sleeve" CD's may be for you. Mini-sleeve CDs are manufactured in Japan under license. The disc is packaged inside a 135MM X 135MM cardboard precision-miniature replica of the original classic vinyl-LP album. Also, anything contained in the original LP, such as gatefolds, booklets, lyric sheets, posters, printed LP sleeves, stickers, embosses, special LP cover paper/inks/textures and/or die cuts, are precisely replicated and included. An English-language lyric sheet is always included, even if the original LP did not have printed lyrics. Then, there's the sonic quality: Mini-sleeves have dedicated remastering (20-Bit, 24-Bit, DSD, K2/K2HD, and/or HDCD), and can often be superior to the audio on the same title anywhere else in the world. There also may be bonus tracks unavailable elsewhere. Each Japan mini-sleeve has an "obi" ("oh-bee"), a removable Japan-language promotional strip. The obi lists the Japan street date of that particular release, the catalog number, the mastering info, and often the original album's release date. Bonus tracks are only listed on the obi, maintaining the integrity of the original LP artwork. The obi's are collectable, and should not be discarded. All mini-sleeve releases are tremendously limited editions mainly pressed on future orders only and once released immediately out of print. This fact along with other latter features we've mentioned make these titles rare collectibles that sell in the collectors markets for $100's of dollars apiece. Special VERY RARE LIMITED EDITION BOX SET ONLY PRODUCED ON FUTURES FOR THIS ONE TIME PRESSING -- were only available in Japan. 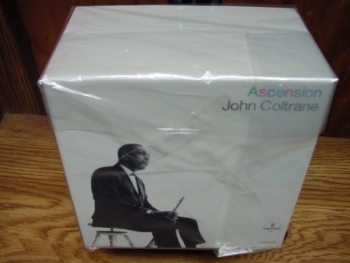 JOHN COLTRANE BOX SET - INCLUDES - ALL TITLES APart of the Impulse Best 50! Series. Japanese exclusive 24-bit 96khz digitally remastered reissue of 1965 album. Packaged in a limited edition miniature gatefold LP sleeve. NEW THING AT NEWPORT - Track Listings 1. Spoken Introduction to John Coltrane's Set by Father Norman O'Connor - John Coltrane 2. One Down, One Up - John Coltrane 3. My Favorite Things/Spoken Conclusion To John Coltane's Set - John Coltrane 4. Spoken Introduction To Archie Shepp's Set By Billy Taylor - Archie Shepp 5. Gingerbread, Gingerbread Boy - Archie Shepp 6. Call Me By My Rightful Name - Archie Shepp 7. Scag - Archie Shepp 8. Rufus (Swung His Face At Last To The Wind, Then His Neck Snapped) - Archie Shepp 9. Matin Des Noire - Archie Shepp MEDITATIONS - Track Listings 1. Father and the Son and the Holy Ghost 2. Compassion 3. Love 4. Consequences 5. Serenity TRANSITION - Track Listings 1. Transition 2. Dear Lord 3. Suite SELFLESSNESS FEATURING MY FAVORITE THINGS - Track Listings 1. My Favorite Things 2. I Want to Talk About You 3. Selflessness EXPRESSION - Track Listings 1. Ogunde 2. To Be 3. Offering 4. Expression 5. Number One LIVE AT BIRDLAND - Track Listings 1. Afro Blue 2. I Want to Talk About You 3. Promise 4. Alabama 5. Your Lady 6. Vilia [*] QUARTET PLAYS - Track Listings 1. Chim Chim Cheree 2. Brazilia 3. Nature Boy 4. Song of Praise 5. Feeling Good [*] 6. Nature Boy [First Version][*] 7. Nature Boy [Live][*] IMPRESSIONS - Track Listings 1. India 2. Up 'Gainst the Wall 3. Impressions 4. After the Rain ASCENSION - Track Listings 1. Ascension [Edition II] 2. Ascension [Edition I] These are Japanese digitally re-mastered Mini LP replica CDs (the OBI Edition). This Limited Edition Collection has only VERY FEW made world-wide and are immediately Out of Print. Recorded from the finest Original Masters available. Comes with anti-static sleeves similar to Vinyl LPs, Cardboard packaging like an LP. Actual miniaturized version of the 12inch LP in 4inch CD version.